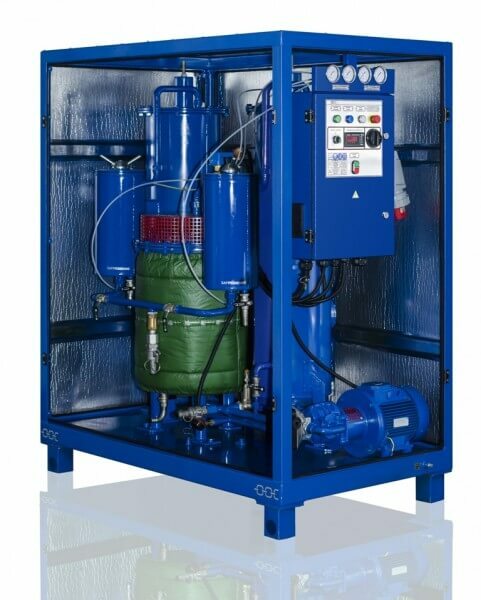 Transformer Oil Dewatering - GlobeCore. Oil Purification Systems. Any oil used in electrical equipment must comply with certain requirements. I.e. its quality and parameters must not be below the values stated in regulatory documents and equipment manuals. Any deviation may lead to transformer malfunction and outrage. Some of the most important indications of oil quality are its dielectric strength, moisture and gas content. For instance, oil for 750 kV transformers must not contain more than 0.001% water and 0.15% gas (by volume). These requirements make degassing and dewatering of transformer oil an essential component of transformer servicing. Water in the oil may come from two sources: from the atmosphere or as a result of the aging processes in the solid insulation of a transformer. Water can be present in the oil in varying forms. It may be absorbed, solved, emulsified or free. In the first case, water molecules are tightly bound to oil molecules. In this form the water has little impact on the dielectric strength of the oil. However, with temperature changes, this water may become solved or emulsified. In the second case, the molecules of water are between the oil molecules and not in direct contact with each other. Such was also has little effect on the dielectric strength. The most dangerous forms of water content are emulsified and free water. Emulsified water forms when the molecules coagulate into small droplets. In turn, free water forms from emulsified water or as a result of large water droplets entering the oil directly. Spherical water droplets in the oil stretch in the electromagnetic field. These droplets become elliptical and are attracted to one another due to different charges on the ends. This process results in formation of chains with increased conductivity, which cause electrical breakthroughs. A significant decrease of dielectric strength can be caused by even a small amount of water. Water amounts above 50 ppm can cause breakthroughs and transformer failure. deterioration of physical oil properties under increased temperatures. The above factors are sufficient to understand how important transformer oil dewatering is. One of the preventive measures to protect transformer oil from water is to create a layer of gas between the oil and the air (e.g. nitrogen). This layer becomes the barrier between the oil and the water in the air. Another measure are cartridges filled with silica gel. This adsorbent captures water and prevents it from contacting with the transformer oil. Still, even with the best preventive measures in place, it is impossible to completely prevent presence of water in the oil. This is where transformer oil dewatering comes in. Centrifuges and filter-presses were used to solve this problem in the past. However, these were cumbersome and complicated in operation. New equipment has been developed, based on two different approaches: processing of oil with adsorbents, as well as heat and vacuum treatment. These methods are now the most common. The heating method of transformer oil dewatering involves evaporation of water at atmospheric pressure or in vacuum. If the oil contaminated with water is heated above 100°С, it will start to foam. Besides, oxidation processes will intensify, especially if the oil contains no antioxidant additives. Therefore the oil is only heated to 80-90°С under atmospheric pressure, which only allows to evaporate a part of the water. Complete removal of water is possible under vacuum. This method is highly efficient even in cases where the oil forms a stable emulsion with the water, which is difficult to separate otherwise. Oxidation is also not a factor in this process, as there is no air in the vacuum chamber. Another method transformer oil dewatering is adsorbent treatment. We have mentioned the use of silica gel for oil protection above. When the oil already contains a lot of water, zeolite (a molecular sieve) is used. These adsorbents capture a lot of water, so they can be used to dewater oil with a large amount of water. Adsorption is recommended for oil with dielectric strength of 10 kV and higher. It should be noted that zeolite does not absorb hydrocarbon substances and aging products. This means that oil regeneration requires other adsorbent media; zeolite can be used in the pretreatment stage of regeneration. When zeolite is saturated, it is reactivated to restore its properties. Besides, each reactivation makes that a part of the adsorbent is lost. In this regard, transformer oil dewatering with heat and vacuum is better, since it does not generate waste which requires disposal. On the other hand, the zeolite process does not require heating, as the process occurs efficiently at 15-25°С. One pass through the zeolite unit can increase the dielectric strength of the oil to 60 kV (from10-20 kV), and water content decreases by an order of magnitude. 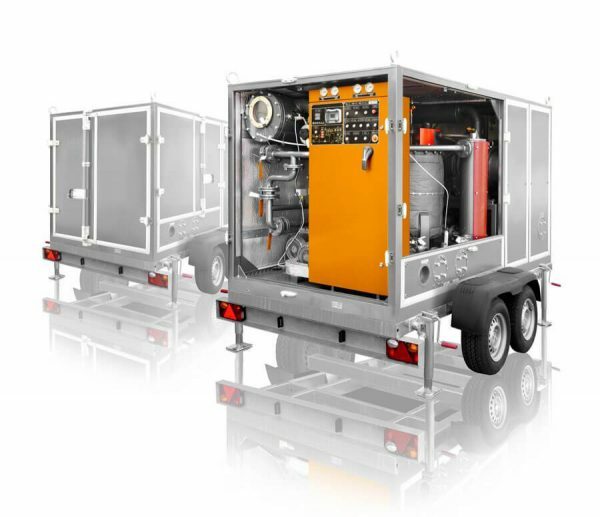 In general, the zeolite transformer oil dewatering unit includes adsorbent columns (usually operated in parallel), an oil pump, an oil heater and a filter. Particulate matter is removed from the oil by the filter, then its temperature is increased by the heater and it is supplied to the adsorbent columns by the pump. GlobeCore always strives to offer a wide range of options to clients. We have equipment both for zeolite dewatering of oil and for the heating and vacuum process. In the former case, you can use the MCU units, in the latter case we offer the CMM type units. The MCU units are based on the classical adsorption process technology. For ease of operation and reduction of down time, zeolite can be reactivated by connecting the unit to BRZ-100 zeolite regeneration unit. The CMM units are designed for different capacities (starting with 600 liters/hour). Larger and more powerful units of this type can also pull vacuum on transformers and fill transformer with oil, beside the primary function of degassing, dewatering and filtration of transformer oil. 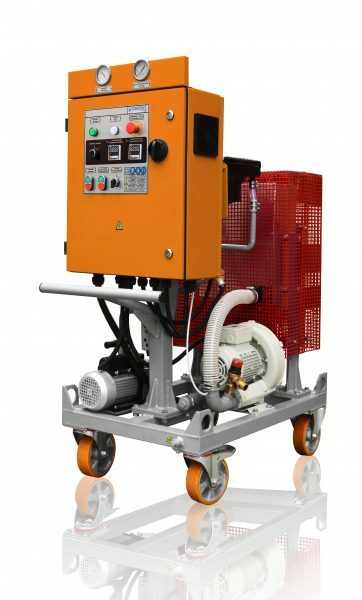 GlobeCore equipment is designed and manufactured with consideration of all customer requirements. We select component parts, construction material, unit mobility (stationary, on wheels or on trailerized), extra options (particle counters, remote control etc) individually. 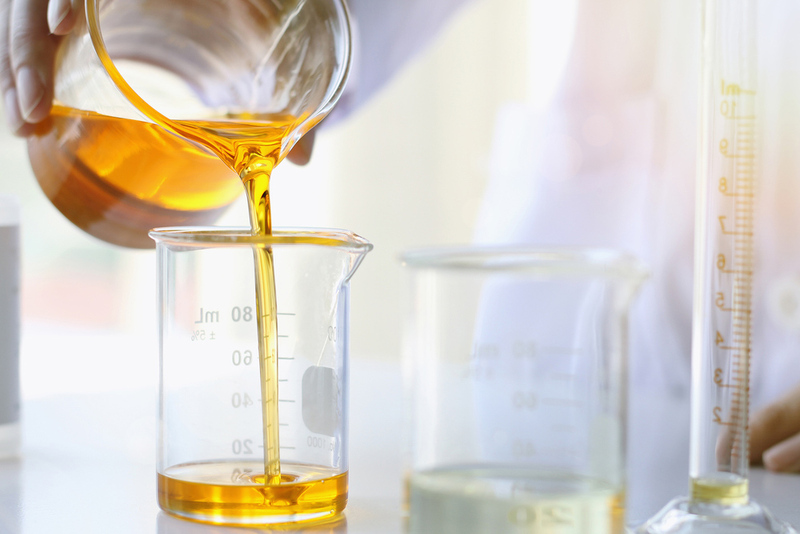 Our specialists are always ready to offer free qualified advice on purification and regeneration of transformer oil in general and transformer oil dewatering specifically.